Hi SUN Cellular subscribers! 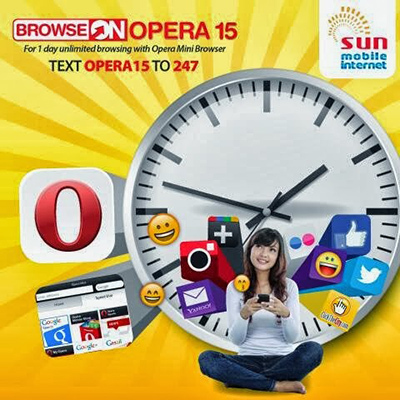 enjoy Unlimited Mobile Internet access via SUN Cellular Opera Mini Browser. To avail this promo, just send a text <Keyword listed below> to 247. Once your subscription is activated, just Download FREE Opera Mini Browser using your mobile phone browser and enjoy nonstop browsing. Promo may be also availed for one (1) day via Opera 15, seven (7) days via Opera 80, fifteen(15) days via Opera 160 and thirty (30) days through the Opera 299. Only use your Opera Mini browser in surfing and browsing. Regular browsing charged of P5 for 15 minutes in excess of 15mb on streaming of videos and downloading of content. Visit www.suncellular.com.ph for full promo details and latest updates.